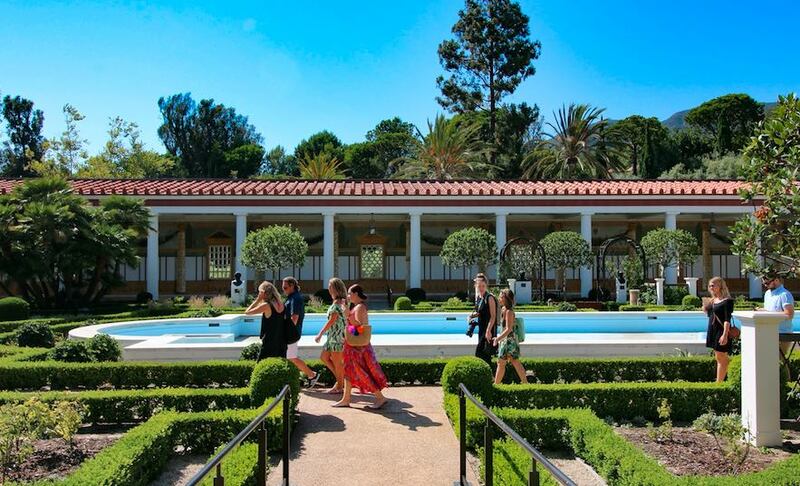 A summer walk at the Getty Villa. Photo by Brian Champlin / We Like L.A.
You know what’s handy? Waking up in the morning, firing up your phone/computer and being able to scan a super quick (but curated) rundown of the best of what lies ahead. So here it is, our list of fun things to do in Los Angeles for today, Tuesday, January 29, 2019. 1. [5 p.m.] The Food Truck Collective presents Chatsworth Eats every Tuesday. 3. [6 p.m.] Bottle Logic from Anaheim will stop by Tony Darts Away in Burbank bringing with them some of their signature brews. 4. [7 p.m.] There’s a Men’s Yoga session happening in West Hollywood that specifically targets common areas of tension on the male body like shoulders, hips and hamstrings. 5. [7 p.m.] Los Angeles Magazine’s 6th Annual Best New Restaurants Celebration 2019 returns on January 29 for a celebration that honors the city’s most appetizing openings. 6. [7 p.m.] Q Highballr: an 80s Après Ski Party at Big Bar in Los Feliz. 7 [7 p.m.] There’s a Downton Abbey Trivia Night happening at Hamburger Mary’s in West Hollywood this Tuesday. 8. [9:30 p.m.] Gothic Book Club with John Palisano at The Last Bookstore. 9. [7 p.m.] The Creators Society January 2019 Animation Social at The Attic. 10. [various] Alfred Coffee Melrose Place celebrates their sixth year anniversary with special surprises and freebies all day long.